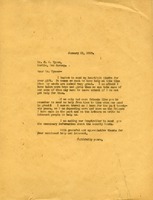 Mrs. S. P. Harbison thanks Martha Berry through her secretary (Pearl Cochrane) for the money Martha Berry gave to the Annuity Bond. In return Mrs. Harbison makes a donation to The Berry Schools. Miss Berry thanks Mrs. Ross for her gift of a $5,000 Annuity Bond for her friend, asks her how she would like it to be handled and implores her to visit in the future. 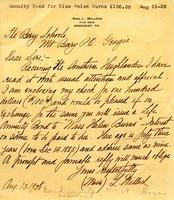 Letter from Miss L. Willock contributing $100 Annuity Bond in the name of Miss Helen Burns. 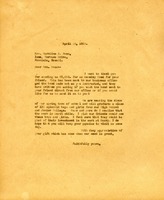 In this letter Miss Berry expresses her appreciation for Mr.Tyson's donation, and explains the need for more donors like himself. 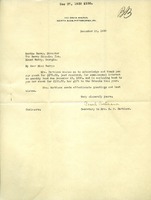 Mr. George Q. Lyson thanks Martha Berry for the cotton balls and sends a check for $10. He also inquires as to whether or not she issues annuity bonds.